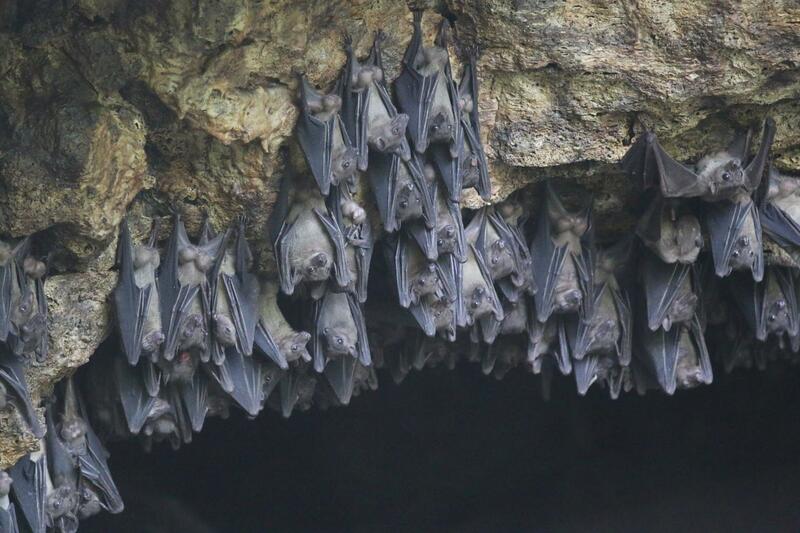 Scientists examining the genome of Egyptian fruit bats, a natural reservoir for the deadly Marburg virus, have identified several immune-related genes that suggest bats deal with viral infections in a substantially different way than primates. Their research, published online today in the journal Cell, demonstrates that bats may be able to host viruses that are pathogenic in humans by tolerating–rather than overcoming–the infection. Bats are known to harbor many viruses, including several that cause disease in humans, without demonstrating symptoms. To identify differences between antiviral mechanisms in humans and bats, the research team sequenced, assembled, and analyzed the genome of Rousettus aegyptiacus, the Egyptian fruit bat–a natural reservoir of Marburg virus and the only known reservoir for any filovirus. Jonathan Towner, Ph.D., of the Viral Special Pathogens Branch at the Centers for Disease Control and Prevention (CDC), provided the bats from which the DNA was extracted. Towner had traveled to Uganda to investigate the colony of Egyptian fruit bats implicated in a Marburg fatality there. "Using that DNA, we generated the most contiguous bat genome to date and used it to understand the evolution of immune genes and gene families in bats. This is classical comparative immunology and a good example of the link between basic and applied sciences," explained co-senior author Gustavo Palacios, Ph.D., who heads the Center for Genome Sciences at the U.S. Army Medical Research Institute of Infectious Diseases (USAMRIID). In the process, Palacios and colleagues at CDC and Boston University made some striking findings. Specifically, they discovered an expanded and diversified family of natural killer (NK) cell receptors, MHC class I genes, and type I interferons, which dramatically differ from their functional counterparts in other mammals, including mice and nonhuman primates. A theoretical function evaluation of these genes suggests that a higher threshold of activation of some component of the immune system may exist in bats. NK cells are immune cells that play a crucial role against viral infections. To be tolerant against healthy tissue and simultaneously attack infected cells, the activity of NK cells is tightly regulated by an array of activating and inhibiting receptors. In this publication, the authors describe finding genomic evidence of a bias toward the inhibitory signal in NK cells. "Further evaluation of these expanded sets of genes suggests that other key components of the immune system like the MHC- and the IFN-loci in bats may have evolved toward a state of immune tolerance," said Mariano Sanchez-Lockhart, Ph.D., of USAMRIID. The team's initial work focused on advancing the characterization of the bat animal model, as well as on generating antibodies that recognize bat-specific proteins and other reagents to characterize the bat animal model of infection. These tools will allow further characterization of the bat unique immune system. According to Palacios, their next step is to build on the knowledge gained thus far to compare antiviral responses between bats and nonhuman primates. Ultimately, this information will be used to understand correlates of protection in bats and to develop therapeutics against Marburg virus and other lethal filovirus infections. Stephanie S. Pavlovich, Sean P. Lovett, Galina Koroleva, Jonathan C. Guito, Catherine E.
Arnold, Elyse R. Nagle, Kirsten Kulcsar, Albert Lee, Françoise Thibaud-Nissen, Adam J.
Mariano Sanchez-Lockhart, Thomas B. Kepler, and Gustavo Palacios. This research was supported by the Defense Threat Reduction Agency.